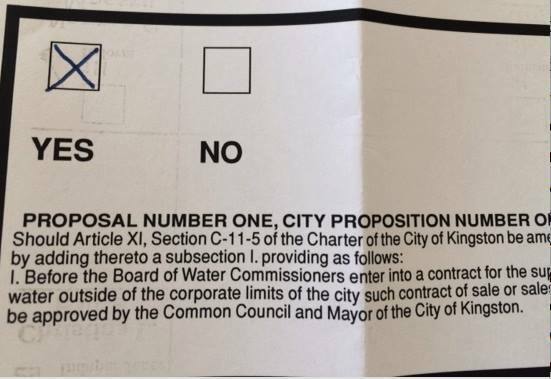 Vote YES on the Water Sales Referendum on Tuesday, November 3rd by TURNING OVER THE BALLOT where you will find the referendum. The Niagara Bottling proposal came out of the blue for Kingston citizens (VIEW the timeline). After extensive work by a growing coalition of residents and stakeholders to bring as much information to the public forward as possible, Niagara abandoned their proposal on February 15, 2015. 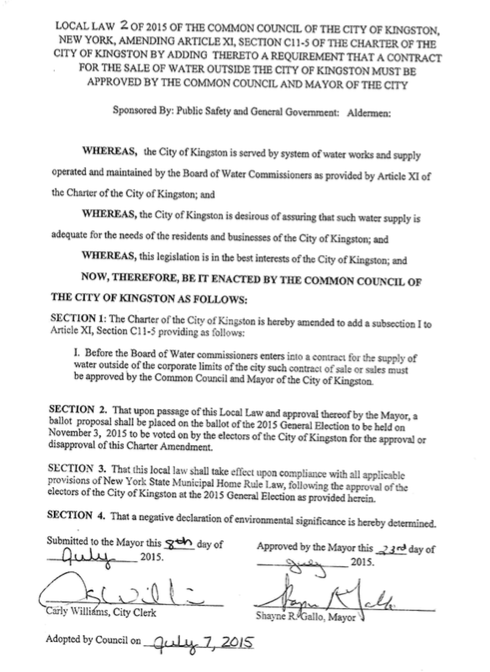 Elected officials acted quickly afterwards, and the City of Kingston’s Common Council unanimously voted (twice), with the Mayor’s approval, to support a Water Sales Referendum that would give the public a say in municipal water sales outside of Kingston’s corporate boundaries to be placed on the ballot this fall. It’s an unprecedented and critical opportunity. Some have asked, will this impact agreements already set in place? The answer, is no. This referendum impacts any contracts moving forward. The process will have to be determined, but it will allow the council to collaborate with the Water Department to set some real criteria to its decision making as should be the case. Here are four important points made by KingstonCitizens.org’s Jennifer Schwartz Berky in our piece “In Their Own Words“. You had no say about whether to sell our limited supply of safe, high quality drinking water to a billion-dollar corporation for a fraction of the rate that you pay. You had no say about the use of your tax dollars going toward the attraction of a polluting industry. You had no say about how this would limit further residential and commercial development in Kingston. You had no say regarding whether this was environmentally detrimental to our community. If you vote “YES” for the Water Referendum, you will for evermore have a say. 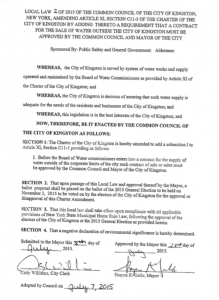 Say “YES” to include Kingston’s Common Council – and the public – to the Water Board’s decision making process in the sale of our precious municipal water. The referendum will appear on the back of your ballot. Make sure you TURN IT OVER when you vote on Tuesday. KingstonCitizens.org is pleased to bring you video from last evening’s Mayoral Candidate debate (10/22/15). Special thanks to Kingston News for helping us to make it possible. Please mark your calendars and VOTE on Tuesday, November 3rd. The polls are open from 6:00am – 9:00pm. To locate your polling place, please visit the BOE POLLING PLACE site for more information. 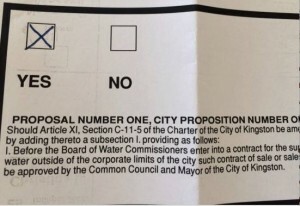 Don’t forget that the Water Sales/Supply Referendum will appear on the BACK OF THE BALLOT! Please consider a YES vote and give Kingston citizens the opportunity have a voice in any future water sales outside of our community.